Myrtle rust continues to be an issue in New Zealand. 988 infected properties have been reported since May 2017. Northland - There are 41 sites/properties in Northland with confirmed infection. Most of these are in Kerikeri. Taranaki - There are 288 sites/properties in Taranaki with confirmed infection. Most of these are in New Plymouth and Waitara. Waikato - There are 121 sites/properties in the Waikato region with confirmed infection. Most of these are in Otorohanga and the Taupo district. Bay Of Plenty - There are 210 sites/properties in the Bay of Plenty with confirmed infection. Most of these are in Te Puke, Bethlehem and Tauranga. Auckland - There are 198 sites/properties in the Auckland region with confirmed infection. Most of these are in Remuera. Wellington - There are 60 sites/properties in the Wellington region with confirmed infection. Most of these are in Lower Hutt and Upper Hutt. 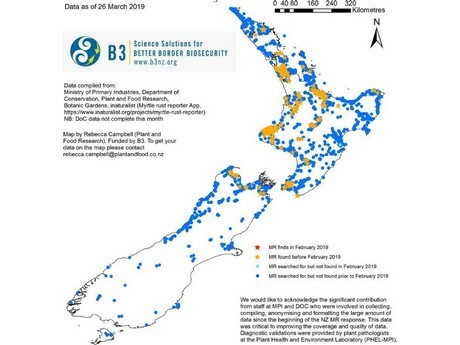 Manawatu-Whanganui - There are 27sites/properties in the Manawatu region with confirmed infection. Most of these are in Fielding. Tasman - There are 26 sites/properties in the Tasman region with confirmed infection. Most of these are in Collingwood, Patons Rock and Pohara. Gisborne - There are 3 sites/properties in the Gisborne district with confirmed infection. These sites are all at the Northern tip of the East Cape. Marlborough - There are 8sites/properties in the Marlborough district with confirmed infection. Nelson - There are 5 sites/properties in Nelson with confirmed infection. For more information, see the myrtle rust update from the Ministry for Primary Industries of New Zealand.